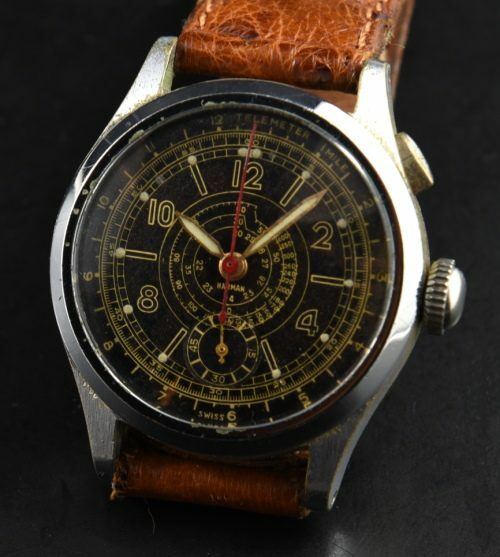 This is a vintage 1930’s Harman Telemeter chronograph from the 1930’s. These Telemeter watches were used to time bombing missions. Perhaps in the USA (where sold) they were marketed for their WW2 era design for the public to wear (just guessing). This is a very cool and small watch, measuring 28.5mm. in a chrome plated case with stainless steel back. The very fine looking black dial with gilt printing and snail trail telemeter scale is original. There is something fun about wearing a small watch such as this, as it draws eyes and creates a conversation. You can tell them Harman Watch Co. was founded in 1933 by Harry Friedman. Harman Watch Co. was located in the watch district at 2 West 46th Street, NY. The company imported SWISS movements and cased and dialed their watches in NY. Harry’s son ran the business until the late 1950’s. This movement was just cleaned and is running accurately and smoothly.